JUICE, also known as the JUpiter ICy moons Explorer, is a European Space Agency mission intended to explore Jupiter and three of its icy moons: Europa, Callisto and Ganymede. A single orbital spacecraft, with no lander, will be the first to orbit Ganymede, and one of a handful of spacecraft to visit the Jupiter system since the 1970s. JUICE is targeted to launch in June 2022 aboard an Ariane 5 spacecraft. It will take more than 7.5 years to get to Jupiter, using gravity assists from Venus and Earth to speed the spacecraft up and get it into the outer solar system. The spacecraft is expected to be inserted in Jupiter's orbit in January 2030, starting a 2.5-year observation session of Jupiter's moons, as well as the planet's atmosphere and magnetosphere. "During the tour, gravity assists with Callisto and Ganymede will shape the trajectory," ESA wrote in a statement. "Two targeted Europa flybys are included focusing on composition of the non water-ice material, and the first subsurface sounding of an icy moon." The spacecraft will fly by Callisto a few times to raise its orbit inclination to about 30 degrees, allowing the spacecraft to catch a glimpse of Jupiter's poles. Naturally, it will also do observations of Callisto during these flybys. Finally, the mission will spend eight months orbiting Ganymede – the first spacecraft to do so – to learn more about this icy moon, before a planned impact on the surface. In 2004, ESA asked the scientific community what would be appropriate space exploration goals in the coming years. The result was released under its Cosmic Vision 2015-2025 program. Questions the program is intended to answer include: "What are the conditions for life and planetary formation? How does the solar system work? What are the fundamental laws of the Universe? How did the Universe begin and what is it made of?" ESA issued a call for proposals for Cosmic Vision missions in 2007, which resulted in a proposal for a Jovian mission called Laplace. Originally it was intended to include participation from NASA and the Japanese Aerospace Exploration Agency. An early formulation suggested a mission called the Europa Jupiter System Mission-Laplace, or EJSM/Laplace, which would lift off in 2020. It would send two probes, called Jupiter Europa Orbiter (NASA) and Jupiter Ganymede Orbiter (ESA), to the moons Europa and Ganymede. ESA had three missions planned with NASA, including EJSM/Laplace, but ESA decided to forge its path alone in 2011. A statement from the time explained there was concern with a recent decadal survey issued by the U.S. National Research Council. These decadal surveys commonly influence NASA's mission decisions. 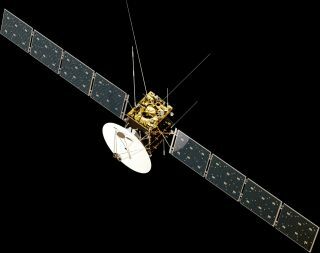 The decadal survey did not identify any of the three joint NASA-ESA missions as a priority, ESA said. "The U.S. budget outlook also became known in February 2011," ESA added in the statement. "In ESA's recent discussions with NASA it became clear that it is quite unlikely that any of the ... mission candidates can be implemented as a joint Europe-U.S. mission in the planned timeframe of the early 2020s." The three missions went to a competition for an ESA large-class mission selection, and JUICE was selected as the first one to be implemented in May 2012. Its proposed launch date was 2022. The other candidates were Athena (Advanced Telescope for High-Energy Astrophysics) and NGO (New Gravitational wave Observatory). Athena was selected in June 2014 for a launch date in 2022; NGO has not been selected for a launch date yet. The instrument competition for JUICE was announced in June 2012, with selections being made in February 2013. JUICE was approved for the next stage of mission development, called implementation, in November 2014. The prime contractor is Airbus Defence & Space, who was selected in July 2015. The Jupiter Icy Moon Explorer, JUICE, and its instruments. Additionally, the probe will look at possible life-bearing chemistry at Europa, including organic molecules. At that moon, JUICE will also seek to understand how the surface features — and specifically non water-ice material — formed. JUICE will be assisted in this endeavor by probing below the surface, which has never been done before at Europa. Among other things, this will help JUICE understand how thick the icy crust is. Since the moons' environments are greatly affected by Jupiter, the planet will also be studied in several ways. The moons' interactions with its magnetosphere, as well as the effects of its gravity, will be studied. The mission will also track Jupiter's aurora and radio emissions, specifically watching their response to the solar wind, the constant stream of charged particles from the sun. Jupiter's atmosphere will also come under scrutiny, ESA said, including such aspects as its chemistry, structure, weather and circulation. Since JUICE will be at Jupiter's system for several years, this will allow for long-term observations across a swath of Jupiter's area, allowing for scientists to better understand how the weather changes, and what circumstances are responsible for those changes. Studying Jupiter is not only important to understanding the giant planet, but also to learning about other gas giants in the solar system and beyond. By making observations of the solar system's largest planet, some extrapolations can be made for Saturn (and to a lesser extent, the much smaller Uranus and Neptune.) Also, the up-close observations of Jupiter can help scientists better understand the behavior of Jupiter-size planets in other solar systems, even if they are far from Earth and hard to study in a telescope. Jupiter is one of the most-visited planets in the solar system. Not only is it a scientifically valuable target itself, but it also is the largest planet and makes an excellent "slingshot" for gravity assists to send spacecraft into the outer solar system to more distant targets. NASA's Pioneer 10 spacecraft flew by the planet in 1973, and Pioneer 11 flew by the year after, both on a journey to the outer solar system. (Pioneer 11 also flew by Saturn.) Pioneer 10 was the first spacecraft to see Jupiter from close-up. Its observations include looking at Jupiter's intense radiation and magnetic field, and confirming that Jupiter had a mostly liquid interior. Pioneer 11 passed by the bow shock of Jupiter's magnetosphere, where it interacts with the constant stream of charged particles from our sun that is called the solar wind. Its observations allowed scientists to learn how the boundary of the Jovian magnetosphere changes as it interacts with the solar wind. NASA's twin Voyager 1 and Voyager 2 spacecraft each flew by the planet in 1979, in separate months. Both spacecraft are still communicating with Earth; Voyager 1 flew by Saturn in 1980 and entered interstellar space in 2012, while Voyager 2 toured Saturn, Uranus and Neptune and is still flying out of the solar system. The two spacecraft combined to take more than 33,000 pictures of Jupiter and its largest satellites. Major discoveries include active volcanism on the moon Io, hints of an icy crust on Europa, and charting activity from storm systems on Jupiter. NASA's Galileo was the first spacecraft dedicated to visiting Jupiter and its moons. It entered orbit in 1995 and was deliberately sent into Jupiter's atmosphere in 2003, ending the mission. Some of its major discoveries included saltwater beneath the icy moons of Europa, Ganymede and Callisto; and thunderstorms on Jupiter that dwarf those on Earth. It also performed more detailed studies of Io's volcanism. Other probes that did flybys include the NASA-ESA sun probe Ulysses (flybys in 1992 and 2004; the mission was decommissioned in 2009), the NASA-ESA Saturn-bound Cassini-Huygens spacecraft (2000) and NASA's Pluto-bound New Horizons (2007). These spacecraft took long-range pictures of Jupiter's system, watched volcanic eruptions at Io and performed observations of Jupiter's radio waves, charged particles, magnetic field and solar wind interactions. There is also a mission at Jupiter currently, Juno, which entered orbit in 2016. Its science objectives include figuring out how much water is in Jupiter's atmosphere, mapping out the composition and properties of Jupiter's atmosphere and learning more about Jupiter's magnetic and gravity fields. It also carries a camera called JunoCam, which is dedicated for amateur suggestions for observations.